I know, it’s January. And January usually means salads, green smoothies, and lots of kale. But not here at Live Simply. Live Simply isn’t about following a diet. Live Simply is about a real food lifestyle. And here’s the thing that I love about this lifestyle: When January rolls around, and dieting and restricting food is all the buzz, we get to enjoy the same delicious, from-scratch, nourishing food that we’ll continue to enjoy long after January. Do we make salads? Absolutely. Do we enjoy green smoothies? Oh yes! Do we munch on kale? Yes, when it’s seasoned with good fat and spices. Do we ditch real ingredients, like butter, due to fear or a fad diet trend? Never! Eating real food (good food) is a long-term lifestyle that’s practical and enjoyable. A lifestyle that was around long before mega grocery stores, nutrition calculators, the “healthy” label, or overly-processed meals. Since January is about enjoying good, nourishing food, let’s make some homemade comfort food–salisbury steak and homestyle mashed potatoes. Okay, be honest with me. Have you ever heard of salisbury steak? Am I the only American left on the planet to just now discover this particular comfort food? After my hasty reply, I Googled, What’s salisbury steak? 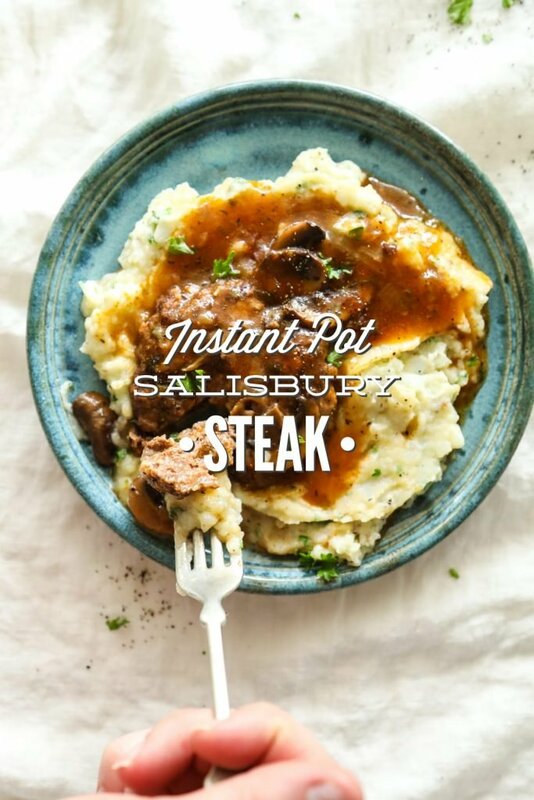 I also talked to my mom and grandmother about the upcoming recipe (since my grandmother is obsessed with her Instant Pot), and discovered that both of them have been making salisbury steak for years (just not when I’m present). Both of them were raised in the Midwest, the land of comfort food: casseroles, corn on the cob, and mashed potatoes. PS: I mean that with the highest respect and adoration :). 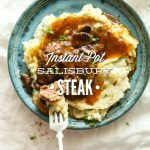 Since this discovery, I’ve made Instant Pot Salisbury Steak multiple times, and it’s quickly become a favorite meal in our home–it’s even been added to our Family Favorite Meals. Before we get to the recipe, let’s talk about the Instant Pot. First, let me just say that I’m not a big fan of special kitchen tools. I’ve found that most of the special tools marketed to home cooks just aren’t necessary. So when the Instant Pot hit the market a few years ago, I was skeptical. A couple of years ago, on Amazon Prime Day, the Instant Pot was marked so low that I finally decided to purchase one, just to see what the hype was all about. Friend, I’m so glad I did! 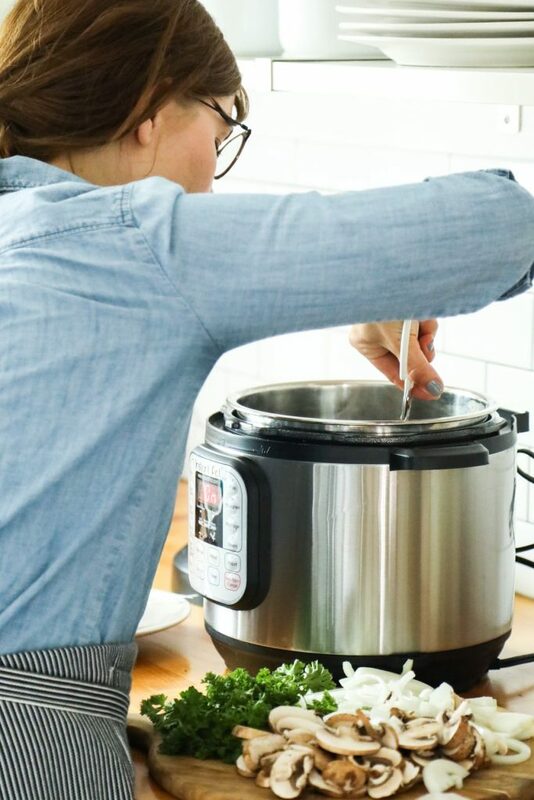 This small appliance is a major time-saver/game-changer in the kitchen (think: the convenience of a slow-cooker in half or a quarter of the time). 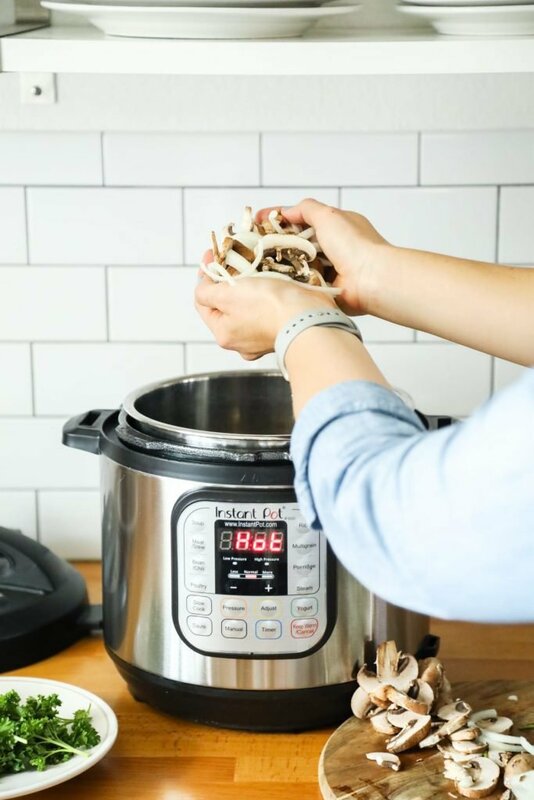 I know many readers have purchased an Instant Pot over the past year or two, just like me, and we’re all looking to put our appliances to work. I’m excited to expand the Live Simply Instant Pot category (a category which currently includes just one soup recipe) over the next year. Get your Instant Pot ready! 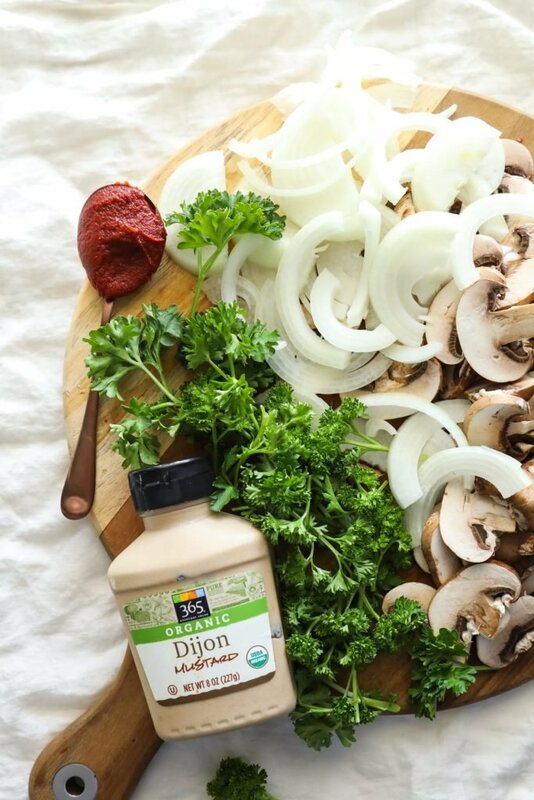 An easy, homemade salisbury steak recipe that's made in the Instant Pot. Serve the steak and gravy over mashed potatoes. Add all the steak ingredients, except the butter, to a large mixing bowl. Combine the ingredients with your hands, being sure not to over-mix. Shape into 6 patties and set on a platter. Let the steaks rest (for breadcrumbs to absorb moisture) while slicing the mushrooms and onion. 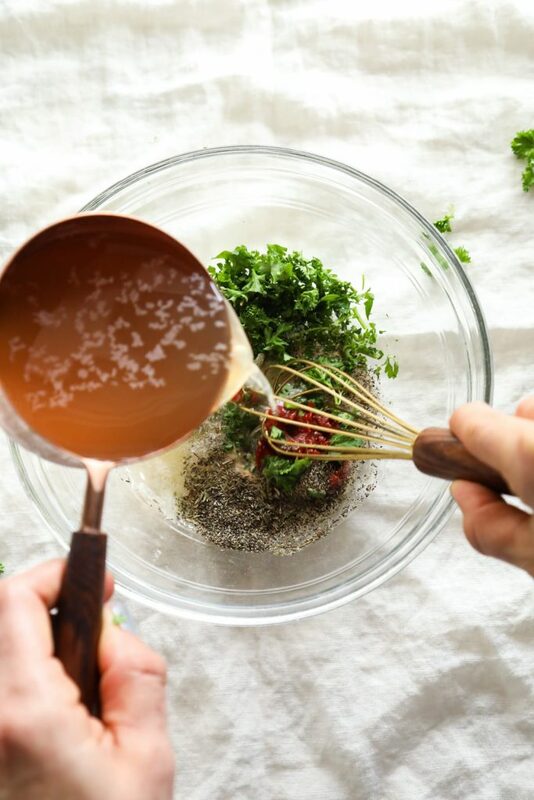 In a medium-size bowl, whisk the gravy ingredients together, except the cornstarch and water, and set aside. Set the Instant Pot to Saute, Normal Temperature. Once hot, add the butter. Brown the steaks on both sides, in batches (about 2 minutes). Wash the platter, and return the steaks to the platter. Set aside. Add the mushrooms and onions to the Instant Pot, and saute lightly for two minutes. Add the gravy mixture to the pot, and scrape the bottom of the pot to loosen any bits (bits = flavor!). Press the Cancel button and add the steaks on top of the mushrooms and onions. It's okay if they overlap in the pot. Lock the lid on and set the Instant Pot to Manual High Pressure for 15 minutes. The valve on top should be set to Sealed. When the cooking time ends, let the pressure release naturally for 15 minutes. Then perform a quick release (turn the valve on the top to Venting) to be able to open the lid. Remove the steaks to the serving platter. Whisk the cornstarch into the cold water. Then add the mixture to the gravy in the Instant Pot, whisking to avoid lumps. Saute the gravy until you reach the desired thickness (about 5 minutes for me). Pour the gravy over the steaks. Serve the steak and gravy with mashed potatoes (recipe coming later this week) or egg noodles--Jovial makes great egg noodles. I've also been serving this meal with an easy side salad. *If you avoid gluten and can't find gluten-free panko, I think almond flour or almond meal may work as the binder. I'm not sure if it will sub 1:1. **I use Bonafide Provisions Beef Broth found in the freezer section at Whole Foods. You may also make homemade beef broth, using the slow-cooker or Instant Pot. ***I prefer thick gravy, so I went with 3 tablespoons of water and cornstarch. Helen used 2 tablespoons of water and cornstarch. You can always add more cornstarch and water (1:1 ratio) during the last cooking step if the gravy isn't as thick as you'd like. Arrowroot starch may work as a sub. This site provides directions for subbing arrowroot for cornstarch. This recipe makes 6 steaks and a good amount of incredible gravy. One recipe is able to feed my family of four (two adults and two young kids) for two nights, or one night and one lunch. I love your website and have been following you for over a year now – it has been so helpful to me and family! This recipe looks so yummy! 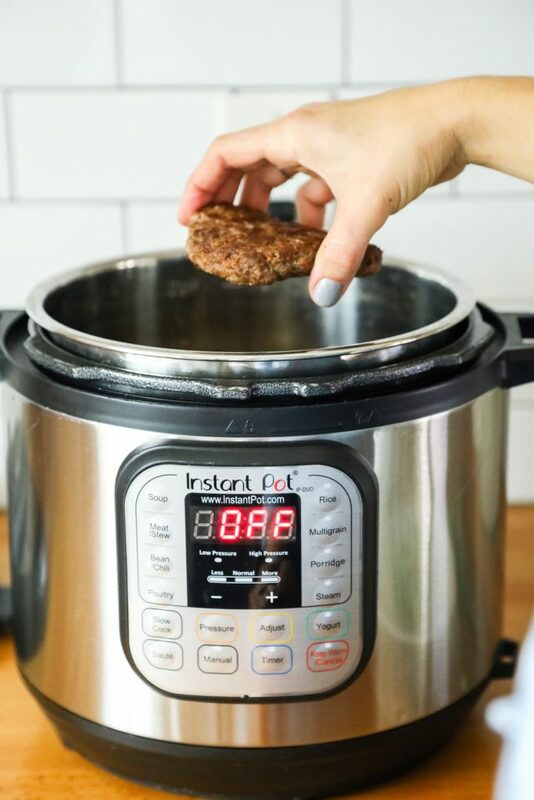 And this is the first I’ve heard of the Instant Pot – I’m intrigued! And love the idea of it. I also saw you mention it on your Instagram story the other day (yes I follow you there too! 🙂 ) You mentioned you made chicken broth in it. I would love to hear some more of your thoughts on that and the instant pot before I purchase it…. did the broth turn out good? How long did it take? Is pressure cooking the food healthy? Have you found other things to cook it in and have you been happy with the way they have turned out? I saw that people have cooked a whole chicken in it. Have you done that? (It certainly would be an easier way!) I really would love your input and feedback – I value it. Thank you so much for all the work you put into your website and the great information you share with us! I’m so glad the blog has been helpful! The broth turned out really well. It doesn’t have the rich flavor of slow-cooker broth, but it was still good. I was experimenting with the time this week, so I think the time should be increased slightly next time. 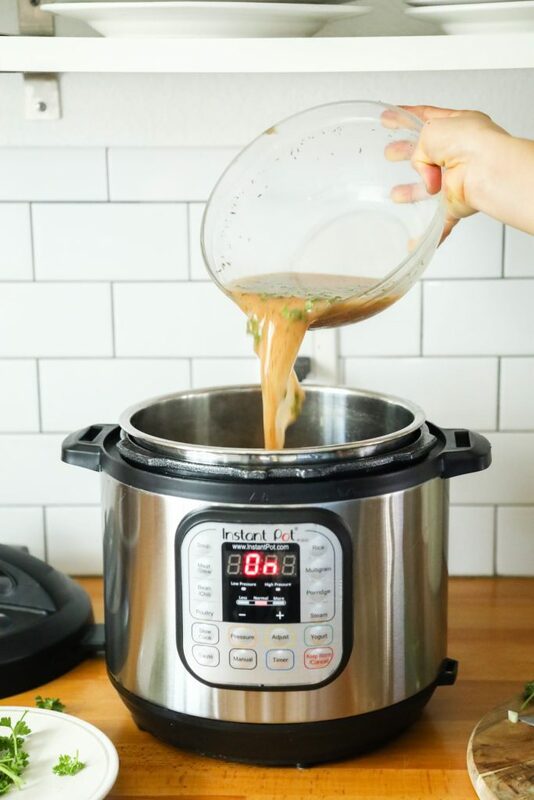 There are quite a bit of Instant Pot recipes now online, so I may do a bit more research on how long other folks are making broth in the Instant Pot. A whole chicken is next on my list. My grandmother just made a whole chicken last week, and she raved about it. Pressure cooking has been around for a very long time, but in the past it’s always been kind of dangerous (at least I remember the fear my grandmother and mother had around using a pressure cooker). The Instant Pot has really changed the way people look at pressure cooking, at least from the safety standpoint. I think the food made in the pressure cooker is just as healthy as the food made in a slow-cooker or oven. So it’s definitely a major winner for the real food kitchen. my understanding on the Instant Pot (and other electric pressure cookers) is that the nutrients stay in the food because it is cooked quickly and efficiently. There isn’t much you cannot do in an Instant Pot! I made a banana bread last week and a meatloaf. Have done many roasts, pasta, chicken pieces and yes a whole chicken. It is fun to cook with and there are many groups on Facebook that are great for help and recipes. Has anyone used chia seeds or flax meal to thicken the gravy? I haven’t made this yet – but plan to this afternoon sans bread crumbs & corn starch. This easy sub makes it Whole. 30 compliant. Hey AK, How did it go? Is arrowroot Whole 30 okay? That will work to thicken the sauce. You could use almond flour in place of the breadcrumbs. We LOVE this meal! Any recommendations on how to cook without the Instant Pot? Hey Jessica, I would cook the butter and cook the patties for about 10 minutes on the stove-top. Then, remove the patties and add the mushroom and onions. You’ll probably want to cook them for 10 minutes so they’re soft. Then add the gravy ingredients, bring to a boil, and then reduce to low. Add the patties back. Cover the skillet and cook the gravy and patties for 10 minutes, until they’re cooked through. Remove the patties and then add the cornstarch and water until thick. I haven’t tried this method, but that’s my best guess :). Let me know how it goes! Just a note to say that this was a fabulous recipe! 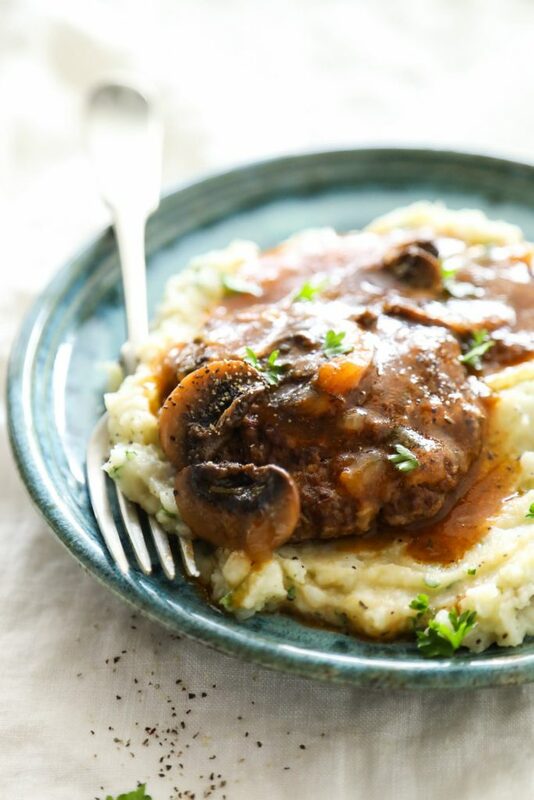 I’ve never gravitated toward Salisbury steak previously but now that I have an Instant Pot it opens up a lot of options and this one turned out so well and will be a fave for both my husband and I plus our little ones. We recently moved from sunny Miami to Chicago so this will be on the list of winter comfort foods! One thing I thought to mention is that I tried to follow the prep directions but didn’t realize the cornstarch and water were to be added in at the end and not mixed together at the beginning with the other gravy items. The gravy still turned out fantastic but just not on the thicker side. Thanks! Hey Merly, That so great! I agree, the Instant Pot really opens up a ton of options that I’ve never considered in the past. Thank you for the note about the cornstarch–I’ll update the prep steps so it’s clear. Do you think this recipe would work in a crock pot? I may just give it a try. Hey Pam, I’m not sure. Maybe if it’s cooked for 4 hours? Do you make your bone broth in the Instant Pot? I love my IP. I just started, Andrea! It doesn’t seem as rich as the slow-cooker, but it’s so fast and convenient! How long do you cook your broth in the IP? Awesome, Denise! I’m so glad you enjoyed it! Oatmeal is gluten free; it’s what I usually use in a meatloaf. I happen to like Salisbury Steak. Your recipe sounds yummy. I never heard of an Instant Pot before, and don’t have one, but I intend to try your recipe just using conventional methods. Hi Kristin, have to thank you for sharing this recipe. Made it tonight and a winner for sure!!! Keep your wonderfully delicious recipes coming!!! That’s awesome, Karen! I’m so glad you enjoyed it! Hi. Can you substitute almond milk for the whole milk? Thanks for sharing the recipe. Hey Ann, Yes, I believe unsweetened, plain almond milk will work. Could you use the pre-formed hamburger patties from the store? I happen to have a package and would like to make this recipe! Thanks! Hey Dayna, I want to say yes, but I’m afraid the patties may fall apart without a binder (the breadcrumbs). It’s worth a try, but the patties may not hold up under the pressure. This recipe deserves 10 stars. It was absolute perfection!!! Do you think it would work well if I double the recipe? Hey Julie, I’m so glad you loved this recipe. I think you could double it, but it might be hard to fit all the steaks in your IP. What are your thoughts about freezing? I was thinking of making this as a double batch (12 steaks), doing the saute then adding the steaks and the gravy ingredients to a bag to do the instant cooking later. Have you tried this? Hey Sarah, Hmmm, I think you could do that! Just freeze the meat raw and I think that should work. I have made this recipe, twice, both times for dinner guests. Everyone LOVED it. We are expecting out-of-town guests tomorrow and I plan serving Salisbury Steak with Easy Mushroom Gravy for dinner. It is absolutely a crowd pleaser. Thank you for this easy & delicious recipe! That’s awesome, Ellen! So happy to hear that. Glad I found this recipe. It’s one of those dishes that make you feel like you’re eating in a fine dinning establishment. Awesome, Dale. Glad you’re enjoying it. We LOVE this recipe in our house! We’ve made it 3 times now and we LOVE it!! This kids really enjoy this one and are starting to ask me to make it more often!! Yay, Amanda. I’m so happy to heart that! If I don’t like mushrooms, will the gravy be any good without them? Hey Shirley, I don’t know for sure since I’ve never made this without the mushrooms. I think it’s a worth a shot. Great, Shirley. Let me know what you think! Such a great recipe!! I eat GF so I substituted crushed corn Chex for the bread crumbs. Amazing flavor and the meat was so tender. I mixed beef and venison for my burgers. Came out great. Thanks for the recipe. We will be having this one again!! Made this tonight for dinner, following the recipe (except I didn’t read through carefully enough and added mushrooms and onion to gravy so I didn’t sauté them). It was delicious, and my entire family loved it. Will definitely be making again soon! Yay, Kristin! I’m so happy to hear that! My husband loved this! Thank you! Yay, Christina! I’m so glad he loved it. Thank you! 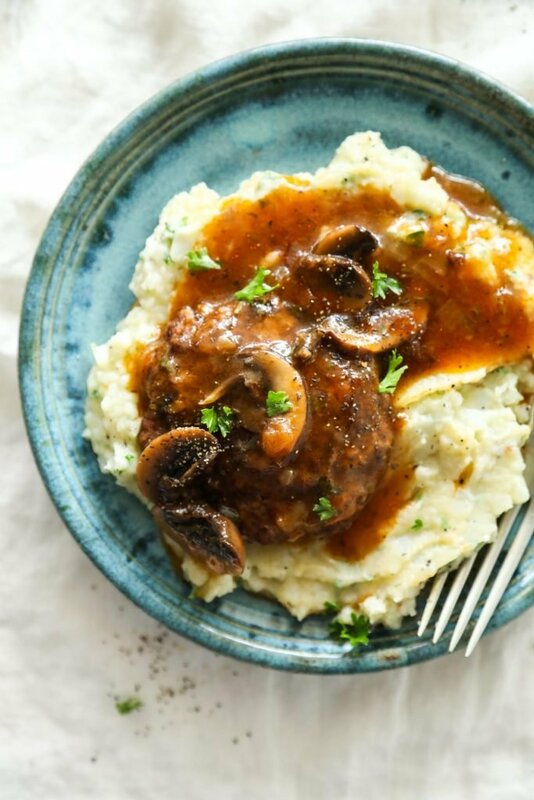 This is a great recipe for Salisbury Steak when you are using an Instant Pot and you also want to cook with fresh ingredients. I’m pretty much up for anything that has Smoked Paprika! My husband has to eat low sodium, so I was able to skip most of the added salt and just use the Worcestershire. He loved it! Yay, Connie! I’m so glad you enjoyed the recipe. It’s great that you were able to tweak the recipe to fit your family’s needs! I didn’t deviate from the recipe and it was fantastic. My husband couldn’t believe it was done in the Instant Pot. We both loved it. Have you figured out how to make the mashed potatoes with the salusbury steak yet! Love the recipe tho. Hey Patricia, I haven’t. I don’t think it’s possible for this recipe in the Instant Pot. Delicious, I did not have dijon, and couldn’t find my can opener, so left out tomato paste too. It was perfect, but pretty labor intensive. I served it with stovetop mash potatoes and sesame mung bean salad. It was so good! I grew up on this dish.. so nice in the IP. My Grandmother was German and always served over Spaetzle. So yummy, comforting and easy! I make it when my steak is bubbling away in the IP. One of my special diners. Looking fwd.To having it. This is yummy! One thing that caused my little cook, who I was monitoring, to stumble a bit was the direction to brown the steaks in batches AND wash the platter, since the platter would never be empty. I convinced her that it would be Okay to put the browned meat back on the used platter since the meat would be cooked more so it wouldn’t make is sick. We made sure to wash it while the meat was cooking so it would be clean before we put the cooked meat back on it. It may seem minor but working with people with autism and other developmental disabilities, as well as people who are not familiar with cooking, these things can really trip you up! Hope this will help someone else along the way! I’m so glad you enjoyed the recipe, Al! Thank you for sharing about washing the platter.